SADAKO VS KAYAKO Archives - Horror News Network - The Horror News You Need! A new clip from the long-awaited Japanese horror film Sadako vs. Kayako was unveiled by Vulture.com today in advance of the full release on the digital horror network Shudder. Shudder (the AMC-owned digital horror network) recently acquired the popular Japanese import Sadako vs. Kayako. 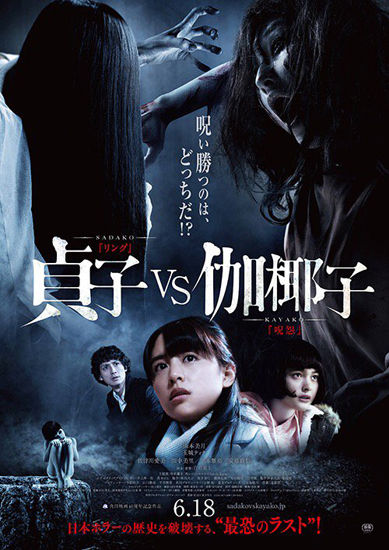 For those unfamiliar with the titles characters, the film features a showdown between the demons from Japan’s two most popular ghost franchises: Ringu and Ju-On (known to North American fans as the Ring and The Grudge). The film is directed by by Koji Shiraishi (director of Carved: The Slit-Mouthed Woman and Grotesque). SADAKO VS KAYAKO – The Ring VS The Grudge – Japanese Trailer! A trailer has been released for SADAKO VS KAYAKO, the insane Japanese film that stars the ghosts from two of their most popular horror film franchises. Sadako from The Ring (Ringu in Japan) and Kayako from The Grudge (Ju-On) in Japan. The trailer is in Japanese, however you can gather most of what is going on. To get the grudge-match going (ha!) The Ring tape is played inside The Grudge house. http://www.horrornewsnetwork.net/wp-content/uploads/2016/05/HNN-logo.jpg 0 0 Lynn Sorel http://www.horrornewsnetwork.net/wp-content/uploads/2016/05/HNN-logo.jpg Lynn Sorel2016-04-28 15:59:382016-04-28 15:59:38SADAKO VS KAYAKO - The Ring VS The Grudge - Japanese Trailer!